Add Infinite on Goodreads, and order it on Amazon, B&N, or Kobo. 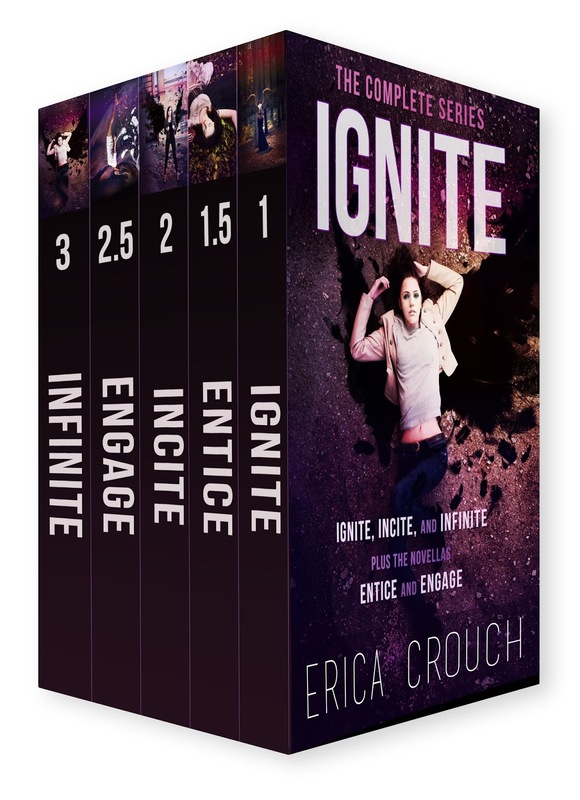 Or, start from the beginning of the series with Ignite and buy the ebook bundle of the series for just $6.99 from Amazon, B&N, or Kobo. Add Infinite on Goodreads, and pre-order it on Amazon, B&N, or Kobo. Let us know what you think of the cover — and what you’re most excited to see in Infinite — in the comments! I circle my arms around his neck and pull him nearer to me. Beneath the water, his hands find my bare waist, his fingers pressing into my skin like he’s trying to stamp his fingerprints on me. I let him, and I lean toward him, allow our lips touch after the briefest pause a breath away. And just like that, we’re lost to each other, in our own infinity. A simple touch and everything around us vanishes. Nothing matters but Michael—the way he’s touching me and the way I’m touching him. All of our wishes coalescing into one, our future full of anything we can imagine. Possibility pulls us forward. We don’t need each other; we choose each other. He makes me better in ways I never could have imagined, and I’d like to hope I help him, too. We share secrets— things we can’t tell anyone else. Things no one else would understand like we do. Our pasts are dark with blood and poor choices, but we’re getting better. We’re making it better, together. At last, we’re trying. His heart slams into my chest, and I swear I can hear my own answering back. Hands on my waist, my ribs, his fingers trailing up my spine. His lips find my shoulders. His movements slow down, his mouth dragging languidly across my collarbone. He pulls back from me. “What poem is that?” he asks. Enter the giveaway, and tune into the live chat 6/30 at 7:30PM EST! Erica Crouch is a young adult and new adult author from Baltimore, Maryland. She has a strange blended aesthetic of cute and spooky, and her books reflect her ever changing mood. (You may find romance, you may find gore—sometimes both in the same book, but probably not at the same time. Probably.) Erica is the cofounder of Patchwork Press — an indie publishing collective that produces middle grade, young adult, and new adult titles in all genres — and Weapenry — a resource for writers. She is the head of editorial services and design, with over fifty projects to her name. In the event that we locate some great and best house this article is great for that. You share some surprising inclination about purchasing a house and it is genuine. I realize with superiorpapers review that inclination isn't great and everybody offer their home with some real issue. So the inclination isn't upbeat around then.